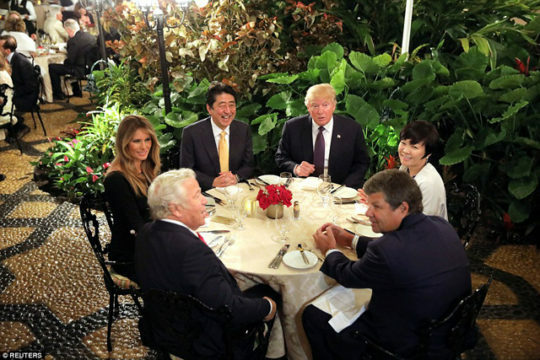 Akie Abe, the wife of Japanese Prime Minister Shinzo Abe, has declared she reverse gaijin smashed US President Donald Trump at the G-20 dinner at the Mar-a-Lago Club in Palm Beach, Florida earlier this year. “Foreigners have had the power of the smash for too long, I thought it was about time I smashed a gaijin,” said Akie Abe. Akie Abe proceeded to smash Trump for almost two hours while the US President told the Japanese Prime Minister and his wife they had tremendous knife and fork skills. “You have fantastic control of that knife and fork, you are going to start winning bigly against that sautéed chicken breast,” Trump told Akie Abe. Akie Abe says she had never reverse gaijin smashed anyone before, but that “it felt good – real good”. Asked if she would like to reverse gaijin smash a foreigner again, she said next time she would like to try it on a Brit. Good for her! On behalf of this America Woman Arrigato Abe San!! The self confessed sexual assaulter in chief! His reputation of disgusting behavior has preceded him! I love these world leading ladies! He deserves NO RESPECT! You do realize that the Abe family is sitting on a heap of scandals almost as hilarious as the 45th’s right?